You'll notice the revamped masthead. The other day I noticed (which I never had before) the image of a security guard and his reflection in the background of the signature picture. Amazing how you can stare at something for so long - this blog is now four months old - and not spot something so obvious. Anyway, it gave me the push I needed to merge the picture into a proper header. I've also devised a favicon (and learned a new word in the process). I hope it's worth it. As a result, I haven't done much proper blogging today, but normal service will be resumed shortly. 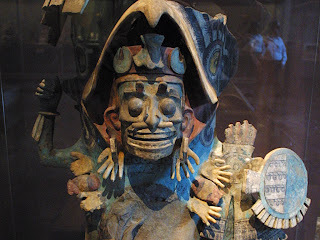 In case you've ever wondered, the image itself comes from the National Museum of Anthropology in Mexico City and shows a brazier in the form of an Aztec warrior. I particularly like his earrings, which appear to be made from the hands of defeated enemies: other human hands adorn his breastplate. Here's the original picture for one last time.